issue to deal with clear window.opener. in web ext VM and 57+, only clear window.opener "fails"
clear window.opener if modified might work in VM (see the new script), but see diffs in what the script actually does. wiki: I have already edited the top few lines of the wiki to clearly say that the scripts will not work with the web ext version of GM. apparently, without looking at the code, just based on your test results, VM uses a different way to inject the scripts and that's why the user-scripts work in their current form. However that method comes with a different set of problems. For example I'm pretty sure the window.opener script doesn't work because the demo page is hosted on a domain with strict CSP rules. That means you can't rely on your user-scripts to work on potentially malicious pages, at all. I can think of at least 1 other problem but won't bother you with the details. re: the 2 different scripts: noopener_by_default works by modifying the links on the original page, while "my" user-script works on the "new" page. noopener_by_default has several issues (1) it's less efficient because it modifies all links targeting a new tab, (2) can easily be tricked to not modify a malicious link, (3) and maybe most importantly, it doesn't clear window.opener when a page uses window.open(). There might be other problems as well, fe. a form can also have target=_blank and it's possible that a page opened that way could also have access to window.opener. If it does then noopener_by_default does nothing against that, either. It can also break a page because adding rel=noopener to a link apparently opens the page without the referer header. EDIT: rel=noopener on its own doesn't remove the referrer header. There's rel="noreferrer" for that. The script in the wiki has none of these problems because it works on the "new" page. VM uses a different way to inject the scripts and that's why the user-scripts work in their current form. However that method comes with a different set of problems. does that mean the other 2 scripts also suffer from the same issue? Or are they OK because they are not modifying content? A bit over my head. So it works then? i.e in VM on 57+? We just get a miscellaneous result because the test expected something else? the script works in its current form with VM BUT with certain limitations and problems due to the way VM works. It will also work in its current form with GM (and probably without those limitations and problems that VM has) once run-at document-start works in the webextension version. I think the GM guys already have a patch ready that fixes @ document-start but they aren't quite satisfied with some other things in that patch. does that mean the other 2 scripts also suffer from the same issue? you tell me. You're the author of Conceal history.length, aren't you? ^^ Nah... not every link. So somehow interfering when same-domain is undisired also for author. Thats something I was asking at #75 (comment) but being ignored/forgoten. I moved GM in the wiki from legacy to non-legacy, it's had three+ releases to mature. I don't wish to rehash what already exists ( https://github.com/violentmonkey/violentmonkey/search?utf8=✓&q=document-start&type=Issues = 9 issues with document-start) but it's all over my head 😭 and I can't seem to find a dedicated topic on it. @earthlng Is an extension a feasible solution? i.e none of the document-start, strict CSP hindrances - and one that works the way you described, by modifying the linked page, not the source page. Very basic webextension that injects the user-script listed in the wiki. No whitelist support or anything like that. Not listed on AMO because I don't want to deal with people asking for new features or bitching about how it breaks some sites. It is what it is, take it or leave it. I might improve it when I move away from ESR but hopefully until then GM will be able to correctly run scripts like this again. The extension also works on ESR52 but it's probably more convenient to use the user-script with legacy GM for an easy way to exclude certain sites. @crssi it's only my opinion but yes I think it's possible that an attacker can abuse window.opener on same-domain as well. the xpi - works on the test site perfectly, thank you. Should we link to it in the wiki (with your disclaimers)? eg add it to the extensions wiki page? Should we link to it in the wiki (with your disclaimers)? eg add it to the extensions wiki page? I'd like to. As you said, the other script can be fooled, we have issues with document run start in VM & GM, and not sure about the other extension (which modifies the links) - whereas your modifies the new page (which is better? right?). tl;dr: AFAIK, windows.opener be gone (covers same-domain right as per crssi's question and your reply? ), while it can be improved in future (whitelisting) is the BEST solution - right? whereas your modifies the new page (which is better? right?). it clears window.opener whenever it is not already null. It's better in the sense that it doesn't matter how window.opener was set. There are several tags in HTML that can use target=_blank of which at least <a> and <area> support the rel=noopener attribute, according to mozilla. But there might be others besides these 2 that could also result in window.opener being set, like form or whatnot, IDK. 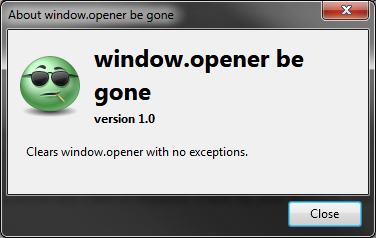 And window.open() also sets window.opener. don't touch my tabs only modifies <a> tags.